As you already know, the 2018 Women’s Final Four is coming to Columbus March 30 & April 1, 2018. 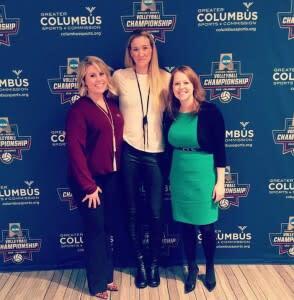 The countdown has begun and the woman leading the charge to market all things Women’s Final Four is none other than Greater Columbus Sports Commission Marketing Manager Jenn Cartmille. 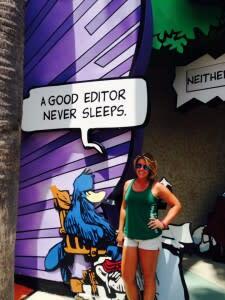 Read on below to hear more about Jenn’s background, her favorite spots in Columbus and of course, information on the Women’s Final Four and the exciting new #FourUS campaign! Sports Commission: Talk a little about your background—where did you grow up and go to college? What did you major in? Jenn Cartmille: I’m a big believer that life comes full circle and as I reflect on my childhood, great memories were around sporting events. My mom taught me, and is still teaching me, everything about sports. Our family dog use to hide in the other room as she yelled at the TV when the game wasn’t in our favor. I grew up in Akron and came to Columbus when I attended The Ohio State University. Graduating in 2011 with a B.A. in Strategic Communication, Columbus had become my home and I didn’t see the value in leaving. And I’m so glad I didn’t. I’ve seen the city grow tremendously and it’s been very kind to me, both personally and professionally. I’m currently pursuing my master’s in Integrated Marketing Communications (IMC) from West Virginia University with an expected graduation date of December 2017. Sports Commission: How did you find your way to the Sports Commission? JC: I love this question because people always think that I had worked in sports prior to joining the Sports Commission, but in reality I was working at a local law firm in their marketing department. Talk about polarizing industries! I was looking for the next step in my career and while at a networking event, I had mentioned this to an acquaintance in the industry. Next thing I know, she sent me the opening and when I reviewed the Marketing Manager position, I knew it was the right fit, especially while obtaining my master’s degree. The sports industry ended up being a bonus at that point. I certainly don’t regret my time at the law firm—it gave me a foundation, steered me in the direction my career was intended to go and helped me develop a skill set I use at the Sports Commission today. Sports Commission: What are your favorite sports to watch? JC: I am very specific about my sports and I’m very passionate about the teams I watch. I grew-up in a household that valued collegiate football and professional basketball. Many people think that means I watch NFL but I prefer collegiate and I would argue it’s a whole different game when you compare the two. The students play with a different level of heart and of course, I’m an Ohio State alum, so it’s ingrained in us. If you haven’t watched the WNBA, I encourage you to turn your attention to it. The athleticism and passion you see on the court will leave you wanting more. Sports Commission: What is your role for the Sports Commission and some big projects that you’ve worked on and some that are coming up? JC: My role at the Sports Commission is split into two “buckets” if you will—the brand assets such as website, content marketing, social media strategy, and overall ensuring we are meeting our marketing objectives while maintaining our mission and vision throughout each step. And then there are the events that have a large-guarantee ticket component, high image profile and/or require a robust marketing plan. The 2016 NCAA DI Women’s Volleyball Championship would be a great example. That event was the warm-up to the 2018 NCAA Women’s Final Four, which our team is fully immersed in right now. Collateral, grassroots activations, social media, website—you name it, we’re on it to ensure it is the best NCAA Women’s Final Four in history. 300 and some odd days remaining but who’s counting? Another exciting project that we are working on is set to launch in the fall. It’s a culmination of many goals for the Sports Commission and embodies the diverse sports scene we have in Columbus. Sports Commission: What makes you so excited about the Women’s Final Four? What will it mean for the community that such an important event is here? JC: I get tears in my eyes thinking about the NCAA Women’s Final Four (not surprising to my co-workers, I’m sure). And it really is because of the passion that not only I share for this event but that the people of Columbus share for this event. It’s a community event, it places female athletes at the forefront, and it’s simply unlike any other basketball–scratch that–unlike any other sporting event you’ve witnessed. The NCAA Women’s Final Four is more than three games, it’s more than three days, it’s creating a movement and conversation around Columbus’ passion for supporting, hosting and embracing high-profile events that put our city on the map. I’m confident that once the NCAA Women’s Final Four comes into our city, Columbus will make its mark on the event and impact each of the 40,000 visitors. Sports Commission: What are some big events coming up for The Women’s Final Four? JC: We want our community to be a part of the NCAA Women’s Final Four from start to finish, which is why #FourUS was created and is so important. #FourUS is about Columbus and is dedicated to the collaborative, energetic, passionate people who love the city and who will make the 2018 NCAA Women’s Final Four the best, ever. Check out #FourUS here! JC: The obvious answer is that I get to talk sports all day and although that is true, it’s beyond that for me. I get to promote, support and share the city I love. There is nothing, and I mean nothing, that compares to the passion Columbus people have for the city they work, play and live. And I’m so honored that I get to be a part of Columbus’ story every day. Sports Commission: What are some of your favorite spots in Columbus? JC: Self-proclaimed “foodie”- in reality, I just enjoy eating! One of the things I love about Columbus is the food scene, I can’t remember the last time I ate a chain restaurant and to me, that’s a huge benefit to living here. I am currently obsessed with Watershed Kitchen and Bar. Their burger may be the best one I’ve ever had, and I’ve eaten a lot of burgers in my day. I frequent Sushi Ting, which is this hole-in-the-wall place that you would raise an eyebrow at but I promise you, once you try it, you’ll be hooked! Sports Commission: Finally—what is a fun fact about you? JC: I have two different colored eyes! One is split and the other is a mix of the two split colors. I like to think it makes me special. Every month the Columbus Sports Scene Blog will feature a staff member of the Greater Columbus Sports Commission in our “Meet the Sports Commission” segment. Want to learn more? Head over to: http://www.columbussports.org/about-gcsc/staff/.